This great product for mosaic work. 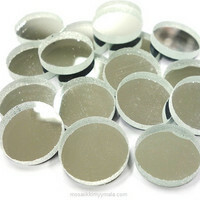 Mirror mosaic, round 12 mm. These are high-quality laser-cut mirrors. UV and frost resistant. Thickness approx. 3 mm. 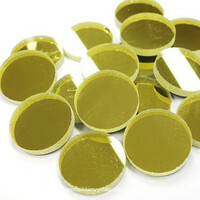 Ideal for mosaic work, they are much more durable than thinner 1.5 to 2 mm mirrors, and for good quality they also suitable for grouting. Colors: Silver and Gold. Pack sizes: 50 g, 125 g and 500 g.